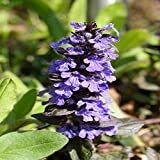 Ajuga reptans growing herbaceous of the genus Ajuga also known as Bugleweed, Ajuga reptans perennial evergreen to deciduous, used as ornamental groundcover plant, grow in temperate climate and growing in hardiness zone 3-9. Leaves color can be blue, black, purple, red, pink or green. Shape can be ovate, heart, obcordate or cuneate sometime with serrated shape. Flower color purple or blue, small flowers grow in inflorescence shape on stalk.